Big hair, big synths -- it must be the 80's! Along with Spandau Ballet, Ultravox ushered in the New Romantics part of the New Wave era with their grand gestures, very image conscious appearances, dramatic song styles, and load and load and loads of synths! After s handful of albums led by John Foxx, the band hit its pop stride when the charasmatic mustached singer/songwriter Midge Ure joined and took the spotlight. Never enjoying the commercial breakout that Spandau Ballet did in the US with their True album, Ultravox was very much a European confined phenomenon. They coaxed Sir George Martin of Beatles fame into producing Quartet. Considering that outside of the Fab Four, he didn't produce many other acts (America, Jeff Beck), I'd consider this quite an accomplishment and an interesting match. With electronics their primary musical tool (and a live drummer - yay for them), you'd be hard pressed to find exactly what George Martin's touch was on the album. Yet, this became their most commercially successful album. "Reap The Wild Wind" launched Quartet with its solo hi-hat and then a wash of those synths to a galloping beat. Ure's vocals eerily resemble David Bowie on this song, who had a tendency to croon his singing, along with the echoed whispers. "Reap The Wild Wind" sounds very wide and cinematic, romping quickly and repetitively, twisting and turning. As pioneered in a song like Gary Numan's "Cars," the multiple keyboard pads and strings dominated the melody with a huge hook of its own. You take my hand and give me your friendship. I'll take my time and send you my slow reply. Give me an inch and I'll make the best of it. Take all you want and leave all the rest to die. Oh, desolation where I once lived. I have seen in times gone by. A stranglehold on a certain feeling. 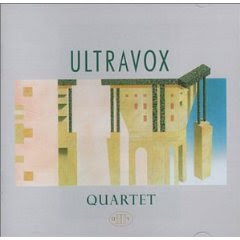 With Ultravox, Ure became a UK national treasure, eventually releasing successful solo albums, while in 1984, co-writing that holiday perennial, "Do They Know It's Christmas," even singing one of the lines. I saw him open an INXS concert at Radio City Music Hall in the late 80's and he stole the show, practically being begged to do multiple encores.